First lets get the color straight. He’s not “blue.” He is śyāma / nīla. The color śyāma is “Dark (black), with slight blue-green coloration.” A really heavy monsoon cloud, for example, is śyāma. The color nīla is “Dark, black, bluish/greenish-black.” A sapphire (nīla-maṇi) is a common example of this color. So, basically, Krishna is black with a sapphire-blue luster. OK, now let’s get to the “why” part. Why is Krishna black? Why is anything black? What is black? Black is what you see when an object reflects no light. Black things absorb all the light that falls on them, letting nothing go. When something attracts all the light, and nothing escapes, it’s black. 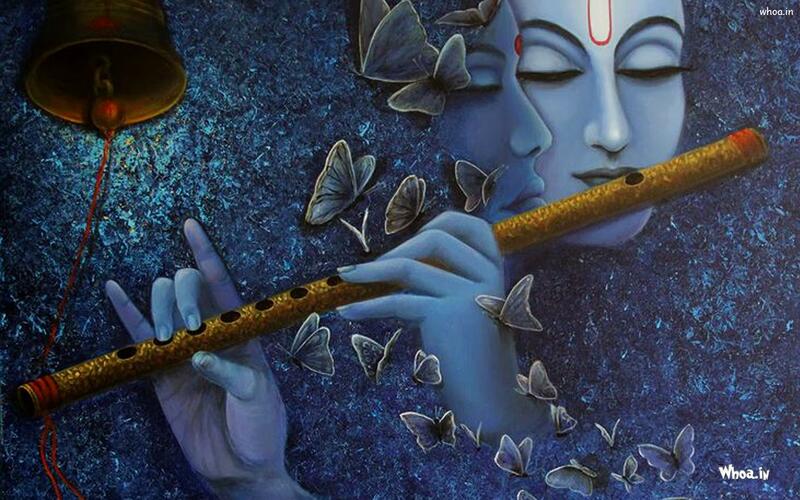 And that’s why Krishna is black, because that’s what Krishna is – All-Attractive. Krishna is so black, because he is All-Attractive. When our consciousness falls upon him, it sticks there forever. When light falls upon him, it never bounces off again. He is black. He is so fascinating, so delectably sweet, so delightfully deep, so thrillingly pleasurable, so enthrallingly enchanting and adventurous… no “light” escapes. Thank you for this, Prabhu. Was very eye opening for my kids and I. Thanks for the wisdom shared here. Sometimes I hear Krishna is dark blue monsoon raincloud, & sometimes dark blue sapphire stone & sometimes tamala tree .Can U give a single explanation for all of this in a more Artistic way of explanation suitable for artists to paint? Sometimes his face is compared to moon & shines in all directions. If he’s dark blue black how can he shine like the moon? If you are an artist you must have an imagination. You can’t make good images without an imagination. Put these descriptions into your imagination and visualize it on the canvas. We cannot paint Krishna anyway, but you can approximate. One reason he is “brilliant black” is to illustrate this very point. Put it in your imagination. Śrī Rūpa says he is like a sapphire mountain with the setting sun sparkling through it.